TURN YOUR YARD INTO A MAGICAL RELAXATION SPOT - Warm weather means time outside with family and friends. Hanging strings of lights creates a calming mood, making good times even better and cheerful all year round. 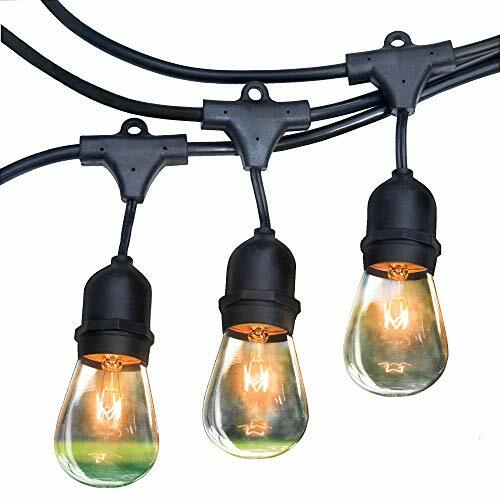 These outdoor lights are great around the patio, backyard, porch, deck, and looks beautiful indoors as well, providing soft, amber, decorative light that is warmer, and not as harsh as LED lights. ROYAL LIGHT BULBS ARE MORE DURABLE Unlike other string lights that include thin glassed bulbs that shatter or break, Royal Light bulbs are more durable, made of thicker glass, which means they're designed to last season after season giving you better value for your money. Our bulb lights are designed to send out smooth, even lighting that makes everyone appear smoother, cleaner and less spotty - perfect for taking group shots making everyone look their best! PERFECT YOUR OUTDOOR LIGHTING WITH OUR BONUS EBOOK + 3 YEAR WARRANTY! When it comes to setting up a string of outdoor lights, it can be a real challenge to find a solution that's aesthetic and practical, that's why Royal Light has included an eBook "How to Design Outdoor Lighting" to provide you with tips, tricks and styling advice to make the most of your outdoor string lights. We're also including a 3 year warranty on our stringed lights, we believe in our product and we're here to serve! If you have any questions about this product by Royal Light US, contact us by completing and submitting the form below. If you are looking for a specif part number, please include it with your message.